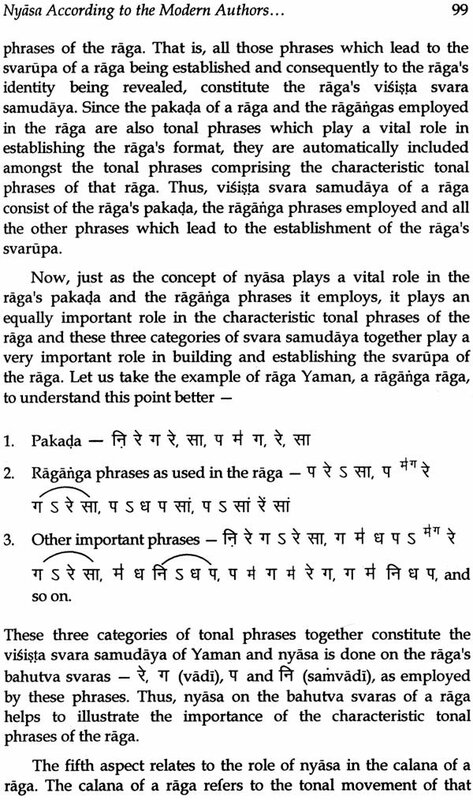 The book, titled “Nyasa in Raga: The Pleasant Pause in Hindustani Music” deals with the concept of nyasa, a very important aspect in the performance of a Hindustani raga. The book takes a wholistic approach while dealing with the subject of nyasa. 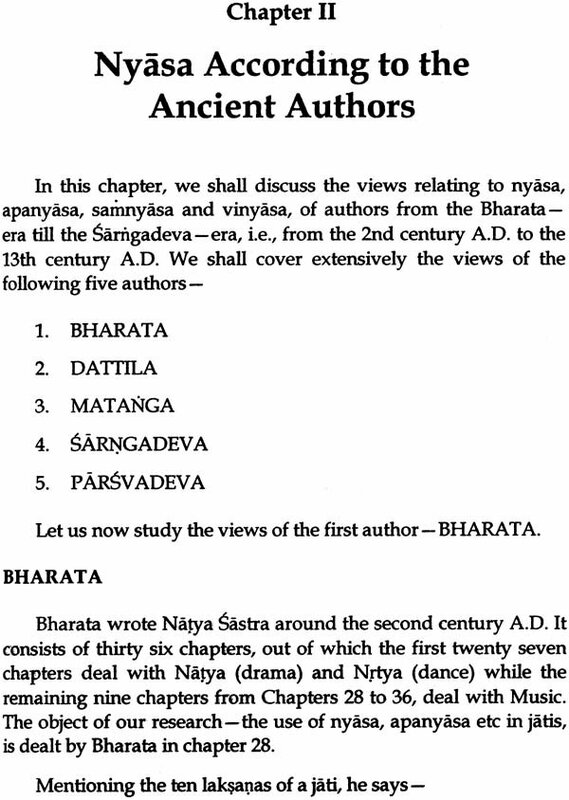 It covers the views of the ancient, medieval and modern authors regarding nyasa. 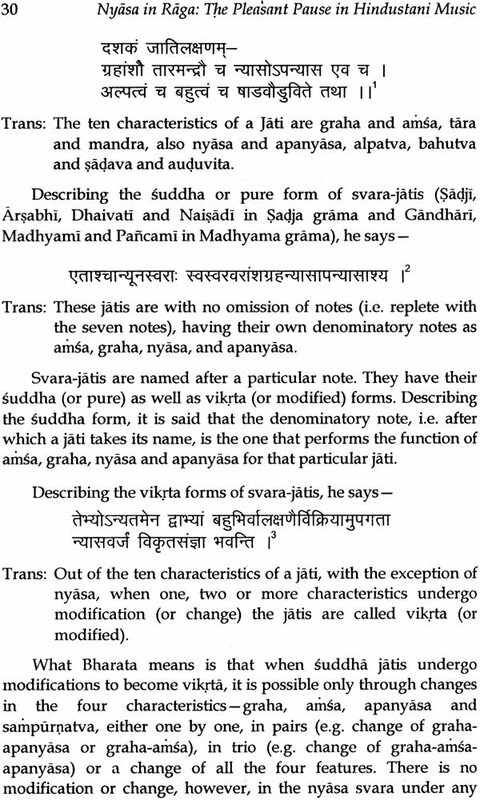 It also gives a comprehensive definition of nyasa and then proceeds to explain various aspects of nyasa vis-a-vis the Hindustani raga. The book is replete with suitable examples wherever necessary, to enable the reader fully understand the fines details about the concept of nyasa. 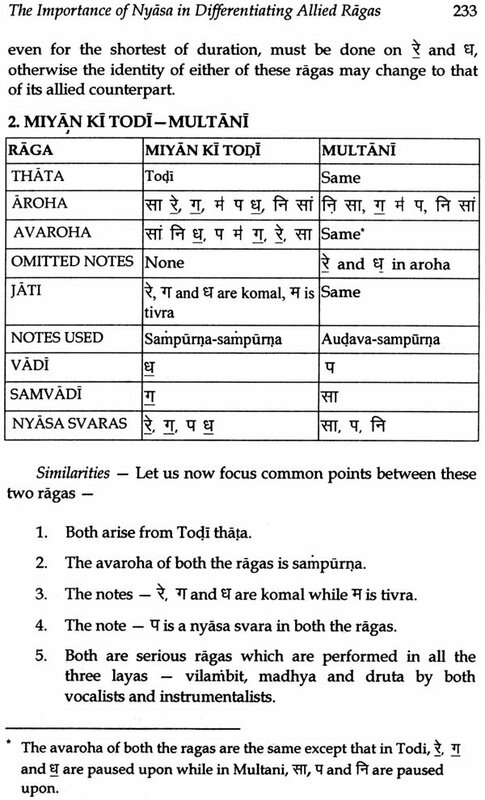 It also has several examples of how nyasa is important during the performance of a raga, as also how nyasa svaras (notes) are instrumental in differentiating allied ragas. 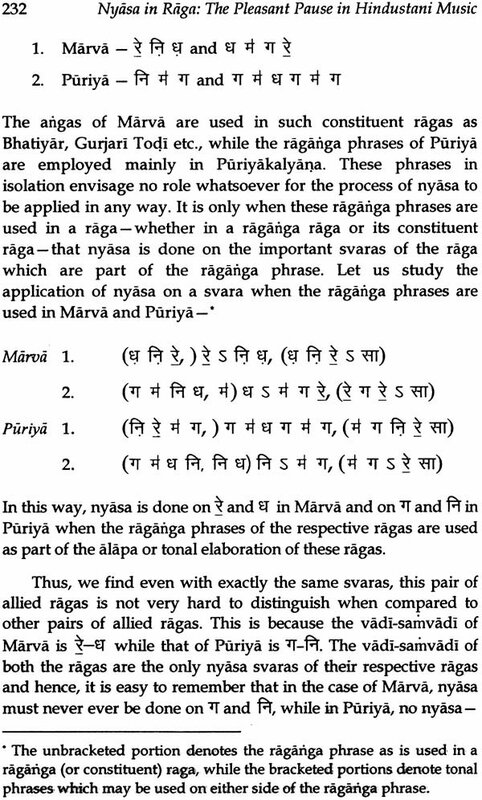 In dealing with the concept of nyasa in Hindustani raga, the book also explains in minute detail, the finer nuances of the performance of a raga, whether from an artiste’s perspective, the listener’s point of view or simply in terms of the raga’s aesthetics. Dr. Ananya Kumar Dey holde the rare distinction of having an outstanding academic record as well as being an excellent performing artiste. He was the toppers in the University of Delhi as a student of Music in B.A. (Hons.) M.A. and M. Phil. He received several awards for his academic excellence, prime amongst them being the Tushar Pandit Memorial Gold Medal, Smt. V. Vani Bai Ram Memorial medal and Kumari Bina Memorial Prize in 1999 from the them Chief Justice of India –Justic A.S. Ananad. He was also awarded the certificate for Upcoming Artistes in 1997, from the then President of India-Dr. S.D. Sharma. As an artiste, Dr. Dey has performed in the USA, Germany, Switzerland etc., apart from several cities in India. He is currently teaching Hindustani Vocal Music as a lecturer in Allahabad Degree Collage, Allahabad, U.P. The title of the book is-“Nyasa in Raga: The Pleasant Pause in Hindustani Music.” The reason for selecting such a topic is that I have always taken a keen interest in the practical aspect of music, i.e., the performance, and Nyasa is a very important in the performance of a raga in Hindustani music. This book is the outcome of a study that undertook regard to the various aspects of Nyasa. This book could not have been possible without the wholehearted co-operation of a few special people, whose contribution I would like to acknowledge. First of all, I would like to thank Prof. (Mrs. Krishna Dean and Head, Department of Music, University of Delhi, who motivated me to take up this very challenging topic. I really feel short for words when it comes to expressing my heart-felt gratitude towards her. She not only helped me giving me invaluable guidance, but also motivated me to give my best at every stage of writing this book. Her vast ocean of knowledge, wisdom and experience made the entire period of writing this book a learning experience. Her husband, Prof. R.S. Bisht, whose in-depth knowledge regarding various aspects of music is truly amazing, helped me immensely in finalizing the little of the book. I am deeply honoured that Dr. Tejpal Singh, of the renowned Singh Gandhu duo. Who is not only an excellent performing artiste of international repute, but who also holds absolute command over the theoretical aspects of music, has agreed to write the foreword for this book. His critical suggestions were instrumental in helping me to fine-tune certain aspects of this book. Words therefore, are not sufficient to express my immense gratitude towards his magnanimous gesture. I also wish to thank all my Gurujan in the Department of Music, University of Delhi, who helped me immensely through their discussions. I would especially like to thank Prof. (Mrs.) Anjali Mittal Dean Faculty of Music and Fine Arts, and Head, Department of Music, University of Delhi, as also Prof. (Mrs.) Najma Perveen Ahmad and Prof. (Mrs.) Sunita Dhar, who all encouraged me a lot so that I could put in my best efforts for this book. Would like to thank everyone in my family, viz,. My parents, brother, wife and also my little daughter, Kuhu. This book could not have been possible without their complete co-operation. By taking care of all my material needs and affairs of the daily life, they ensured that I was able to focus all my energy into research for this book. I shall FOREVER be indebted to all of them. I would like to profusely thank my Guru-Pt. Ramashraj Jha, who gave me vital inputs for this book, especially with regard the performance aspect of certain ragas. I would also like to thank my other Guru-Smt. Anita Roy, whose invaluable teaching lessons regarding the practical aspect of music, were of tremendous help to me, especially while giving suitable examples to explain an important point. I am indebted to all my colleagues at the Allahabad Degree Collage, Allahabad, especially its Principal-Dr. Muktivyas, as also Dr. S.N. Jaiswal, Head Department of Music and Smt. Kamala Bose, Reader, Department of Music. I also wish to express my gratitude towards Prof. (Mrs.) Swatantra Bala Sharma, Head, Department of Music, University of Allahabad, for giving me precious words of advice and encouragement from time-to-time. And lastly, but not in the least of terms, I would like to thank kanishka publisher, Distributors, Delhi, for agreeing to publish this book. Its proprietors, Mr. Madan Sachdeva, deserves special mention for his professional acumen and patience in dealing with the numerous technical problems that arose during the correction of the draft copy. Finally, I would like to mention that while great care has been taken to ensure that there on spelling or other technical errors in this book, readers may kindly forgive me if a few mistakes have escaped my attention. I hope that this book will not only benefit students of music, but will also be accepted and liked by connoisseurs of Hindustani Music. 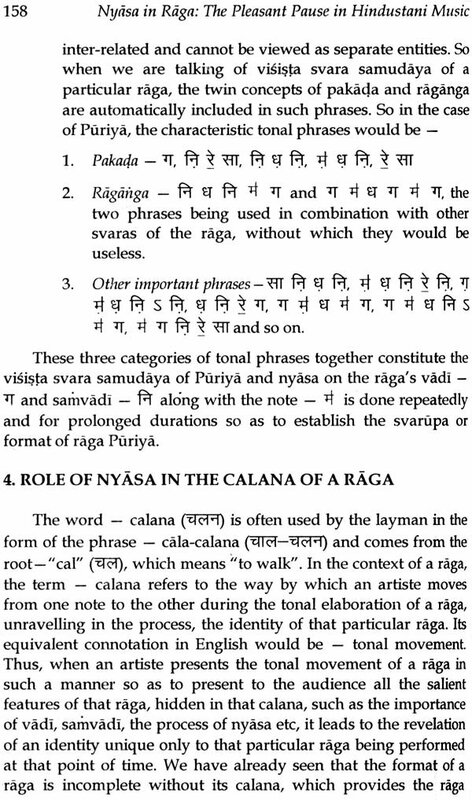 The book, titled-“Nyasa in Raga: The Pleasant Pause in Hindustani Music”, deals with the concept of nyasa in a raga of nyasa in a raga of Hindustani Music. Before we start our discussion on the importance of nyasa in a raga, it would be prudent to first take a close look at the title of the book. 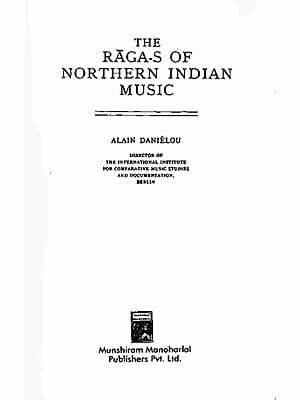 A careful analysis of the title brings out many interesting details about Indian music. 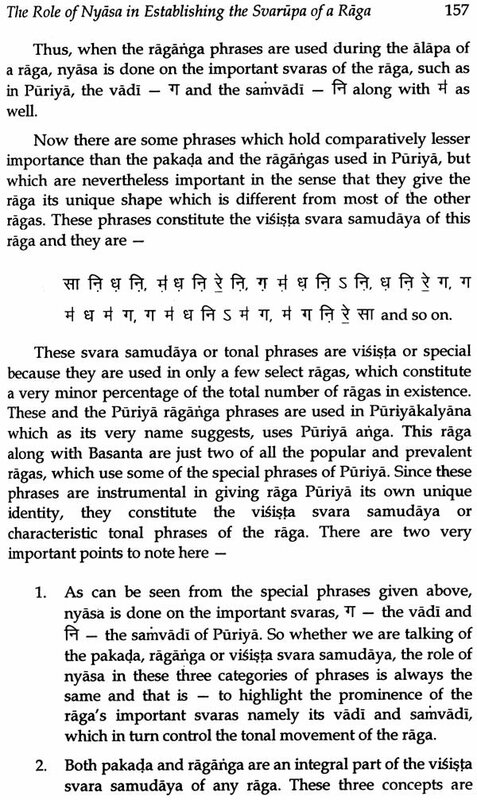 On one hand, we have “Nyasa in Raga”, while on other, we have “he Pleasant Pause in Hindustani Music.” What this simply is that Nyasa denotes a Pleasant Pause, while Raga represents Hindustani Music (in a classical sense). 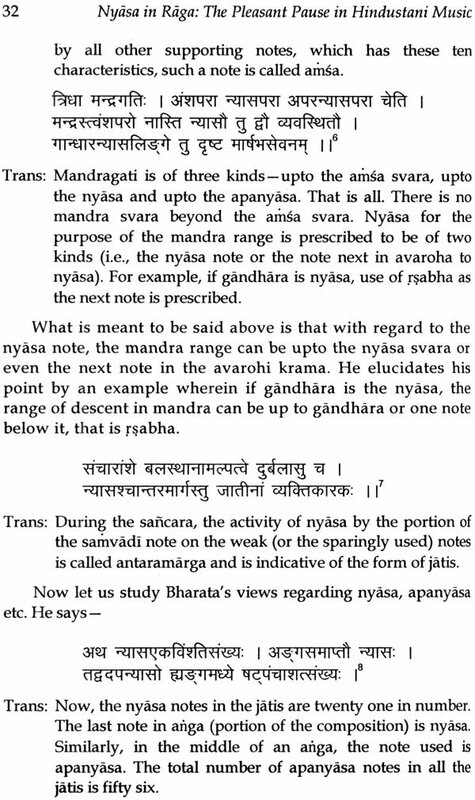 In other words, Nyasa is a pleasant pause in a raga of Hindustani music. Here it is important to understand what we mean by the word “Pleasant” in the title. When we talk of the weather being pleasant, what we are implying is that the weather is so nice that it has a pleasing effect on our minds. Similarly, in the context of music, the word “pleasant” denotes aesthetic pleasure or ananda to the heart, mind and soul of the performer as well as the listener. 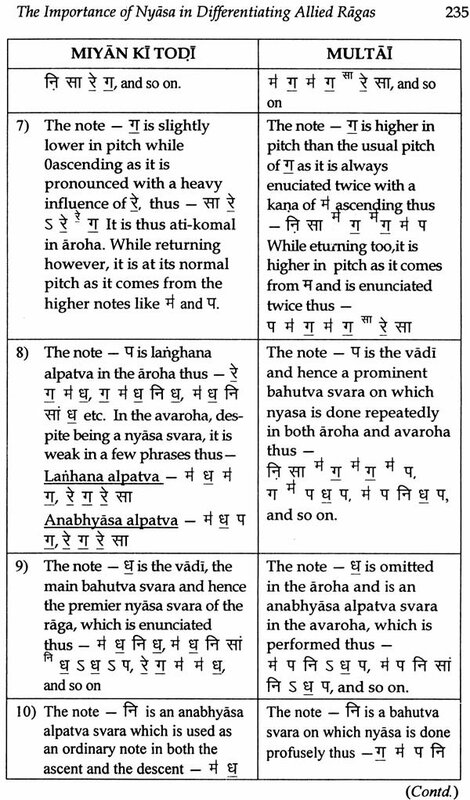 As we shall see later on in our study, the concept of nyasa involves the element of resting temporarily on note while performing a raga; hence simply speaking, the term “nyasa” denotes a pause on a note. The consequence of this pause is that it brings out the inherent beauty of a raga. 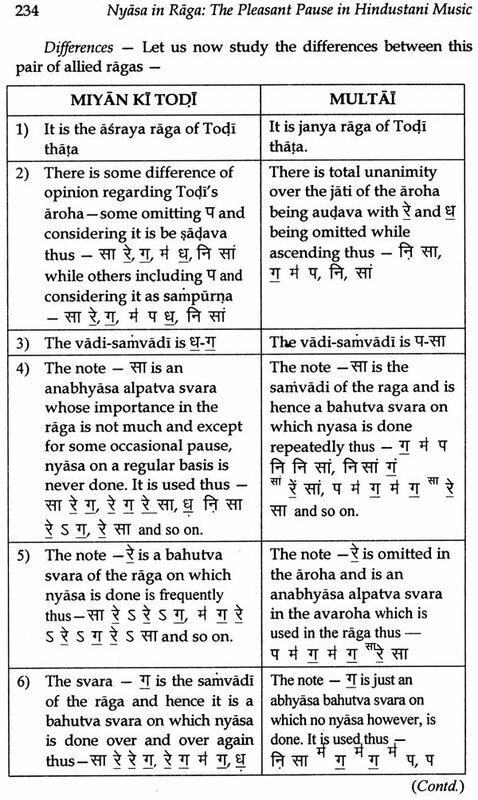 The resultant effect of the process of pausing on a note is that it gives pleasure to the mind or ananda. Hence, the term “Pleasant Pause” has been used in the title of the book. 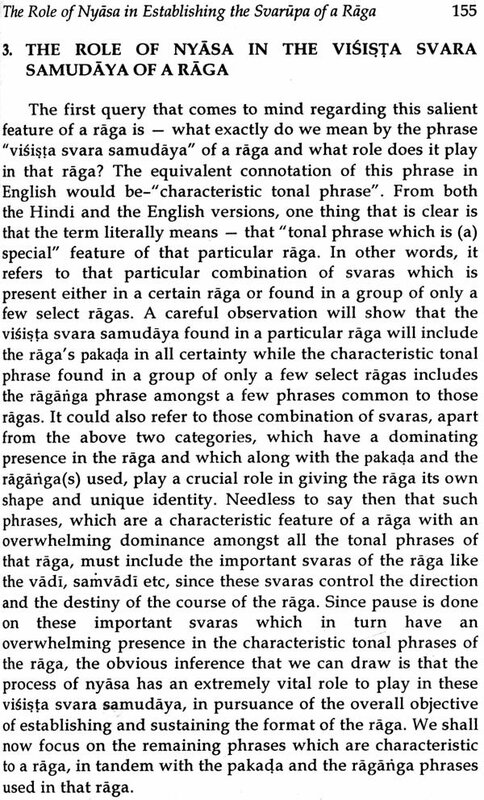 It is pertinent to note here that the term “raga” itself has been defined in the shortest possible and the most precise manner, thus i.e. 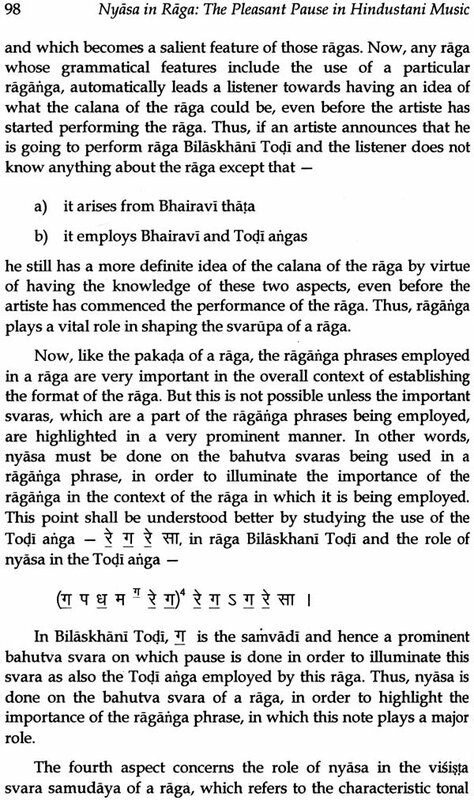 that which gives pleasure (to the mind) is known as raga. 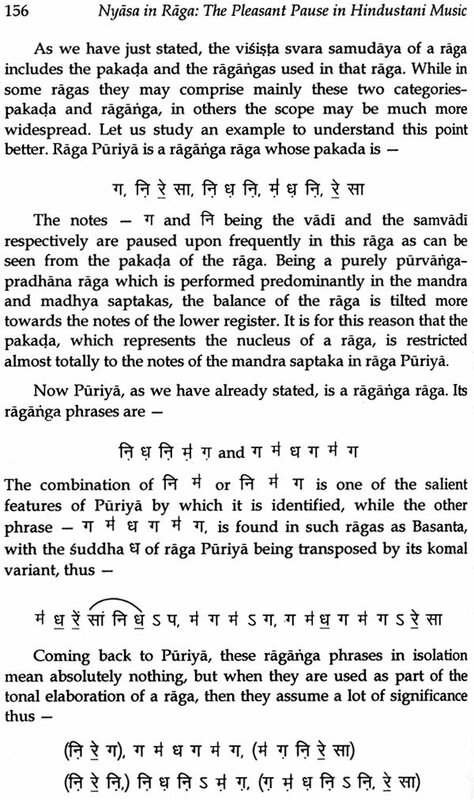 The “Pleasant Pause” or nyasa, as has been described above, plays a key role in bringing out the beauty of a raga, thus creating (aesthetic) pleasure, which the listener then absorbs in his mind. 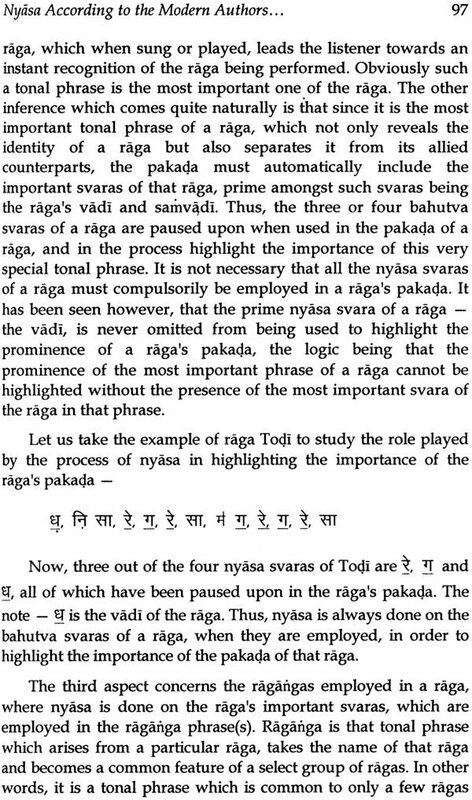 Thus, nyasa is that pause on a note of raga, which creates a pleasant effect in the mind of the listener. The term-“Hindustani Music” in the title, has been used in the broadest of sense. This is to say that nyasa plays a very important role in Hindustani music as a whole. Let us see what we mean by this point. For that, we have to first know what Hindustani music stands for. From the above chart, we can clearly see that the scope of Hindustani music is very wide and include classical forms like Dhrupada and Khyala, semi-classical forms like Thumri and Tappa, and non-classical forms like ghazal and film music. In all such form of Hindustani music, the concept of nyasa plays an important role in some way or the other. 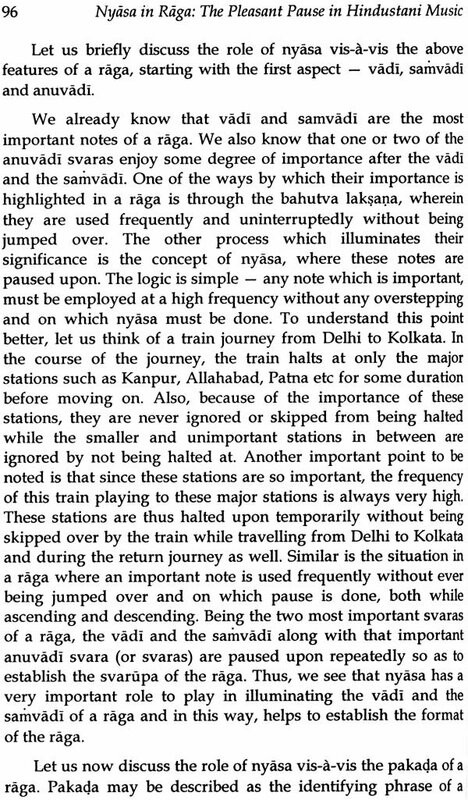 Nyasa denotes pause on a note. This pause is done not only while performing a raga in the classical and semi-classical forms of music, but also in the non-classical varieties such as while singing a bhajan, ghazal or film song. In layman’s parlance, we usually hear the phrase-“holding on to a note” stretching a note.” What is effectively being done, is that the note is question is being paused upon. This phenomenon of holding on to a note stretching a note is very common in non-classical music and can be easily heard while listening to a ghazal or film song. From the viewpoint of classical music, we can say that the singer is pausing on the note, or that nyasa is being done on that note. It may be mentioned here that the ragas of Hindustani classical music have always left an overlasting impression on bhajan singers like Anup Jalota, ghazal singers like Jagjit Singh and film music directors like S.D.Burman. As such, the element of pause being used to enhance the beauty of a song, in order to impart a pleasant effect on the mind of the listener, is not at all surprising. Thus, the concept of pausing on a note to impart aesthetic pleasure to the mind is confined not just to classical and semi-classical music, but also to the diverse musical forms of non-classical music. In other words, the element of pause that element of pause that creates a pleasant effect in the listener, plays an important role in all forms of Hindustani music. Hence, the author has used the phrase-“The Pleasant Pause in Hindustani Music” in the title of this book. Now that we have discussed in detail the title of the book, let us now focus on the central point of our study, i.e. Nyasa. 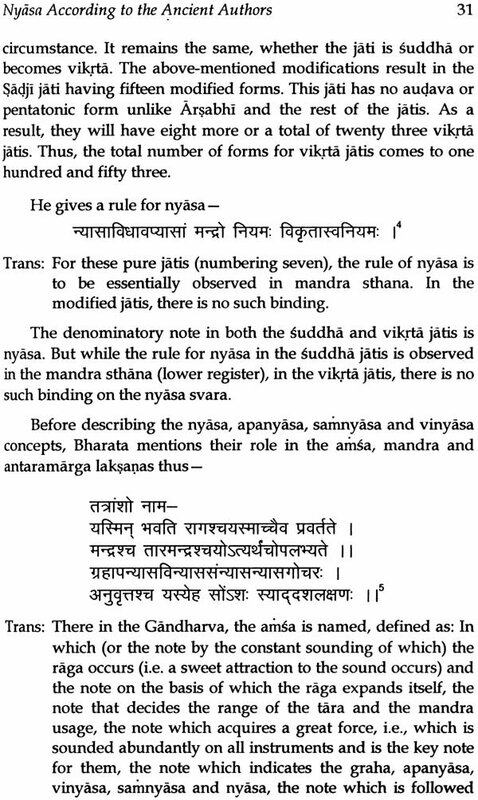 The concept Nyasa has its root dating back to the period of Bharata, i.e. about 1800 years back. It existed in a form which is different from that of the present, though not completely. Before we initiate our study of nyasa and its related aspects, it would be prudent to first take a little glance at the background of the concept of nyasa.